This is the path that will be closed if the proposed changes go ahead. New Bridleway? …and People Power? I can now confirm that the bridleway is planned to be installed in the autumn and that architects are drawing up plans. I apologise for some confusion in the last post about the bridleway. The item is to be considered as the first agenda item on Thursday 4th September. The person responsible for the decision will be at that meeting. As far as I am aware, this will be the first consultation with the Friends of Chadkirk about this planned change to the environment at Chadkirk Country Park. If you use the Country Park , there is a good chance that you will be affected by the change. 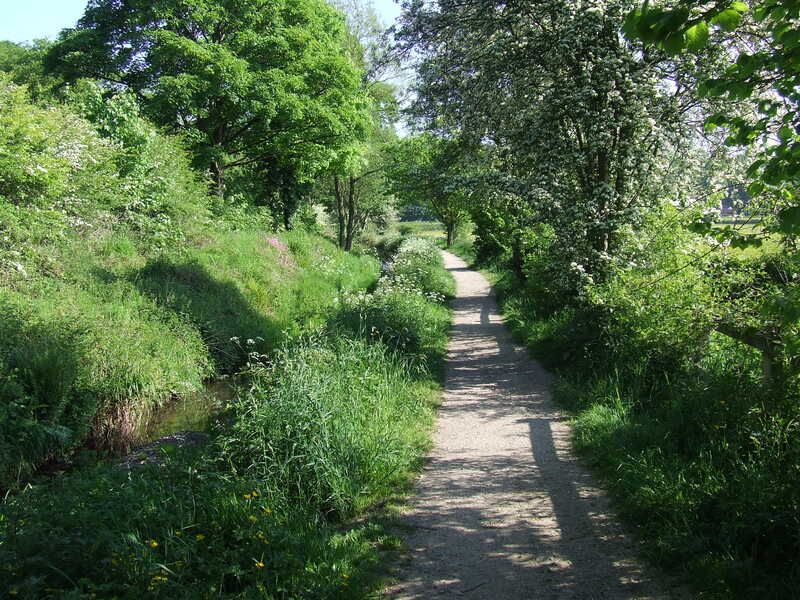 Do you walk along the path by the stream which links the car park to Little Wood? Then you will be interested to know that an Equestrian group has applied for a bridleway that will affect you. Have you been informed of the change? Have you been consulted? Were you given information and then an opportunity to express a point of view? Even if your current answer to these questions is ‘no’, there may be an opportunity for you to influence what happens to the foot paths of Chadkirk. Though you might be well advised to make your view known sooner rather than later. Off the radar, decisions seem to have been taken and the plans have been formed. The plan, as I understand it, is to block off the path by the stream. Walkers will then have a new pathway which will be inside the field, the other side of the hedge. They will be able to walk on the other side of the hedge from the current path and will arrive somewhere close to the bridge over the stream and get into Little Wood that way. This path will be for horses as well as walkers: the new bridleway. Although I understand that the plan has been approved, there may be an opportunity to have some input into the decision. Surely consultation is a requirement for a change like this? The Public Rights of Way may have given the plan the go ahead. However, there may yet be an opportunity for you to make an input into the decision making process and exert your democratic rights. On Thursday 4th September at 7.30 pm there is a meeting of the Friends of Chadkirk. The first item on the agenda is the planned bridleway and the closing of the footpath by the stream. Put your comments in writing and send them to the person responsible for making the decision. Attend the Friends of Chadkirk meeting on Thursday 4th September. Contact local councillors and other elected representatives. Make your views known to other people who are able to attend the meeting on Thursday 4th September. There’s some confusion about plans for a new bridleway in the country park. Has it got planning permission? Is there a conflict of interests? How will it affect other users and visitors to Chadkirk? ..or is it unfounded rumour? Pat has invited a representative to talk about Public Rights of Way who can provide information about this issue. He will be in Chadkirk Chapel on Thursday 21st August at about 11.30 am. This time will suit the volunteers who are gardening in the Walled Garden on Thursday morning. It may also suit other interested parties to call in and listen. The September meeting of The Friends of Chadkirk will be on Thursday 4th September in Chadkirk Chapel at 7-30 pm. Discussion of the bridleway will be on the agenda.